Holy cow folks, it’s another jaw-dropping double feature with Trader Joe’s Uncured Turkey Bacon and Trader Joe’s Uncured Peppered Turkey Bacon. Bacon is wonderful, bacon is divine manna, and bacon has been done to death. The bacon fad (or “baconmania”), which is still ongoing as of this writing, may have died down from it’s bacon salt and DIY bacon vodka heights, but nevertheless the mad hankering for bacon continues nationwide and across the internet. It’s really not my intention to contribute to this inarticulate scream for brined slices of pork belly, good though it is. Instead, and I’m fully aware this viewpoint may well inspire incandescent vitriol among bacon purists, I’m going to try and sell you on turkey bacon – something which I eat frequently. So turkey bacon gives me a healthy choice for my daily bacon consumption and, and guys I’m willing to be real here, that’s all it really has to offer. Turkey bacon is a pale shade of an imitation compared to those fatty strips of pork, but in it’s nutritional profile they are worlds apart. 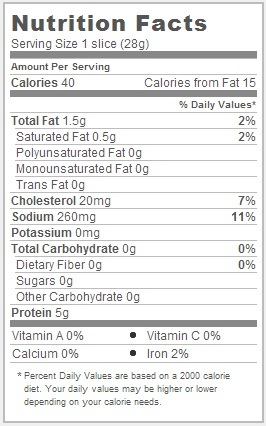 Trader Joe’s Turkey bacon boasts of an astounding 40 calories per slice, 15 from fat. 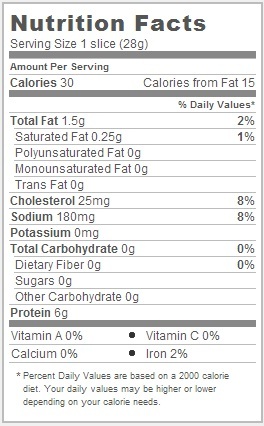 That’s less than a third of the fat that Oscar Meyer serves you with their Center Cut Bacon (70 calories per slice, 50 from fat). In addition, TJ’s has gone fully nitrate, antibiotic and preservative free here, making it that much easier to feel good about eating bacon. Unfortunately, a healthy profile is all there really is to recommend Turkey Bacon. Even I, unrepentant turkey bacon eater I, cannot come to endorse this product to the populous at large. It just isn’t that good, really. Maybe if we lived in a world where there as no pork bacon and turkey bacon was all we knew I might be able to muster some enthusiasm for the product – as it stands, every bite of turkey bacon is beggared by comparison to the real deal. The main issue is not the taste, which is passable to tasty, but the texture, which is awful. Turkey bacon simply does not fry up crispy and crunchy like fatty strips f bacon. It remains perpetually limp and soggy whether you zap it in the microwave or sizzle it in a pan. The regular turkey bacon comes out of this process just this side of edible, as the loss of texture is the price I’m will to pay for healthy bacon. If you’re willing to pay that price as well, like me you’ll be forced to decide between two options, regular or peppered. I’m going to cut right to the chase here because this information is important – choose regular. This is imperative. Whatever is redeeming about the taste of the regular turkey bacon is completely lost on the peppered variety – replaced by a nasty, pseudo-seasoned taste and a long, lingering after taste that resembles sucking on a warm garbage bag – truly unpleasant to the point of inediblity. The existence of this variation suggests that there must be fans of it out there, and I welcome your point of view in the comments, but as for as I’m concerned this abomination should have never been made. Would I Recommend It: Only to those who have decided to sacrifice taste for health. Would I But It Again: Regular uncured turkey bacon, yes. Peppered uncured turkey bacon, no – no, never. Final Synopsis: You don’t choose turkey bacon because you want a good time, but when the cards are down it’s better than no bacon at all. Is the lactate in the turkey bacon from dairy? Or is this a dairy free food? For those allergic to any type of dairy that would be good to know. Guess I am at the other end of the spectrum, I have not tried the peppered but I just finished eating the regular turkey bacon and I think it is good. 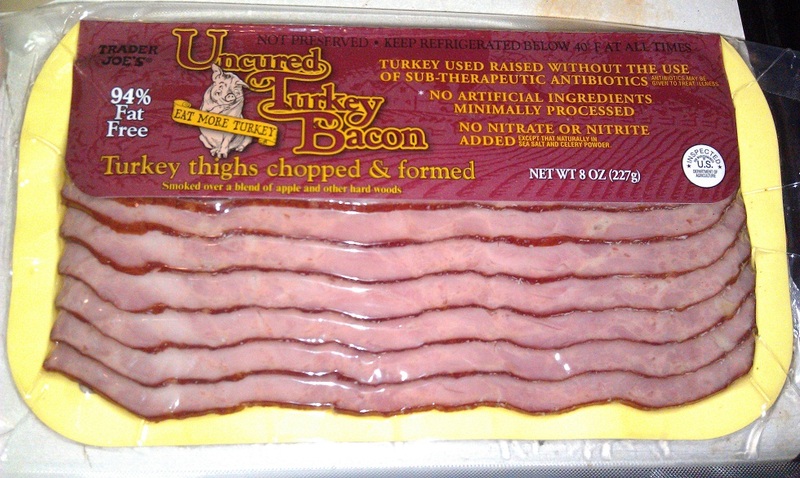 In fact I just commented before I GOOGLED TJ Turkey Bacon, that I was going to buy more. I don’t expect it to taste like bacon or crisp up like bacon, just like I don’t expect turkey ribs to taste like regular ribs, but is a good alternative that is much healthier. The flavor is good and quite frankly the TJ’s brand is much more meaty than all the other brand and it doesn’t have all the toxic stuff. I will be going to buy some more tonight. I’m actually more inclined to agree with you nowadays. It seems like Trader Joe’s reformulated this stuff a little while back, and it’s a meatier, and tastier experience. Still though, it isn’t even in the same ballpark with real bacon. I agree, it’s very tasty and much more healthier for you. I fry the turkey bacon in coconut oil – nice and crispy!